Love mushrooms? This is definitely a Lazy Sunday kind of recipe. It takes a bit longer, but oh is it worth it. 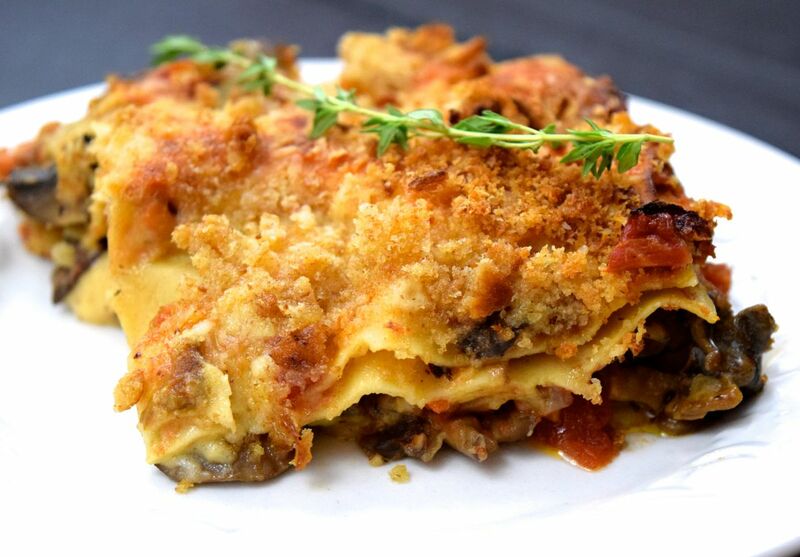 Three kinds of mushrooms enriched with a touch of truffle oil, layered with Dijon cheese sauce and tomato thyme sauce between creamy sheets of pasta and baked to perfection, then sprinkled with crumbs and cheese and crisped up to add a crunchy topping. You know I love some crunch! I won’t pretend this is slenderizing, but if you want to pull out the stops for a special occasion for the mushroom lovers you know, this is just the thing! You might even fool those carnivores. If you’re making this for a dinner party, just put it together in advance and pop it in the oven when your guests arrive. If you don’t have any truffle oil, just leave it out, but if you love mushrooms, it’s nice to have on hand since it’s like a hit of super mushroom intensity! I’ve modified this recipe from a book I believe is out of print: 1000 Vegetarian Recipes From Around the World. It’s a giant compendium born in the UK and published in the US with American measurements. Sometime in the early 2000’s I purchased it in the sale rack at Barnes & Noble and lugged it home. I just measured and it’s at least 3″ thick (hard to tell with all my dog-eared pages and sticky notes)! I think I got a lot of book for my money. Regardless, it’s nice because every recipe has a photograph – many cookbooks don’t feature photographs of everything and I like to see what the final dish might be like. Mine always looks different, though! Also, how do you like my new camera? I’m trying something a bit more sophisticated than my iPhone. But I have to confess, it’s intimidating. So much to learn! Also, my mother has informed me that the default grey font of my WordPress template is not good for her eyes (to be honest it’s not great for mine either – I suppose I was suffering for art) so I’m trying to convert everything to black, but please be patient while I go back and change all my old posts. I’ve done everything since Thanksgiving so far, and will do more as I have time. Equipment: Medium skillet, large heavy skillet, medium saucepan, ovenproof 9x11 casserole dish. Reconstitute your dried mushrooms: Preheat your oven to 400 F because you'll need it later. Rinse the dried mushrooms. Boil some water, then soak the mushrooms in boiling water for 30 minutes while you do other things. Drain and slice. Make your Dijon cheese sauce: Melt the 3 T. butter in a medium saucepan. Stir in the flour and cook, stirring constantly, for 1-2 minutes. Remove the pan from the heat and gradually whisk in the milk. Return the pan to the heat and bring to a boil, whisking constantly. Simmer for about 2 minutes, until the sauce is thick and glossy. Remove from heat, stir in the cheddar cheese, Dijon mustard, and cayenne pepper, and season to taste with salt if needed. Set aside, and don't worry if it becomes thick as it cools. That's good! Make your tomato thyme sauce: Heat the olive oil in a medium skillet. Add the onion and cook, stirring occasionally, until softened, about 5 minutes. Tip in your tomatoes with a pinch of sugar, add the thyme and some salt & pepper, and simmer away for 7-8 minutes while you do the mushrooms. Assemble and bake: Coat your casserole with cooking spray. Spoon in just enough cheese sauce to cover the bottom. Now, you're going to make 4 layers as follows: 3 noodles, ¼ of the tomato sauce, mushrooms, and cheese sauce. Do that 4 times, ending with the sauces on top, and then sprinkle grated Parmesan over all. Cover with foil, and bake at 400 F (which you preheated, right?) for 20 minutes. Add crispy crunchiness: So, if you've done all these steps, you'll remove it from the oven and take off the foil and be rewarded with a gooey cheese topping. BUT! It gets better. Sprinkle a handful of breadcrumbs evenly over the top, then spritz lightly with cooking spray. Put it back in the oven for about 10-15 minutes or until the topping is golden brown and crisp. Let this magnificence stand for 5 minutes before you start serving it. Perhaps with a green salad. Enjoy!